Karin Carlander is a Danish contemporary weaver and textile artist. In her work she reinterprets traditional Nordic crafts and the use of textiles for practical everyday purposes. Anyone who masters a craft holds tacit knowledge that is conveyed through one’s hands and by example. With Textile No. Karin Carlander brings her hand-woven designs into a contemporary context and creates a transparent brand with as few intermediaries as possible between the artistic process and the end-user. These qualities and well thought reflections are stored into the design, and can be sensed in the final textiles, even when they become industrially manufactured. 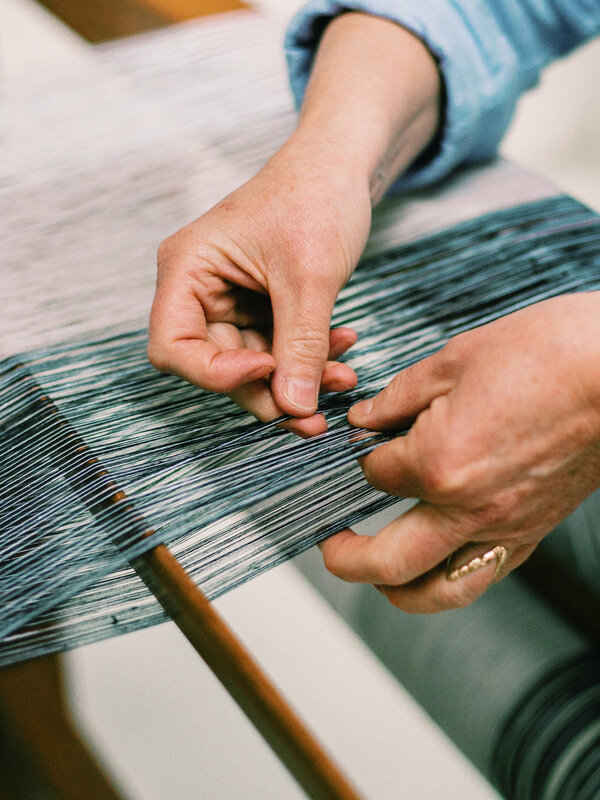 From the studio in Raadvad, north of Copenhagen, Karin Carlander develops her textile design on the beautiful old wooden handlooms, before starting up the production with the best fibre-, spinning- and weaving manufactures. The studio is the core of the artistic process, where she experiments on the loom and work with the materials as part of the process. There is always room for the serendipitous discoveries, that sometimes occurs during the work on the loom. Karin Carlander learned the craft of tapestry weaving at the age of 19, at French weaver Jacqueline de la Baume Dürrbach’s studio in Provence. In 1987 she graduated as a textile designer with major in weaving from what is now known as the Royal Danish Academy of Fine Arts, School of Design. During the education her lifelong interest and respect for Japanese design and craftsmanship was founded, as she spent three months studying abroad in Japan. In 1988 Karin established her own studio. She has spent the following decades creating and exhibiting one-off hand-woven textiles and creating textile designs for several established companies, before starting her own brand Textile No. in 2013.